When SLEEP becomes a 4-letter word. When I was pregnant with the little dude I remember so many people telling me to “get my sleep now”. This was probably the most frustrating thing anyone could say to me because once I hit the 34 week mark, I couldn’t sleep no matter how many positions, pillows, and calming wave sounds I tried. And then it only got worse. So this email is going to be really annoying. Sleep is an integral part of health. It is an integral part of a workout and healthy eating routine. Our bodies are typically drowning in a stress related hormone called cortisol. When our body floods with cortisol (which it is prone to do post-birth what with how stressful it can be to raise a human being!) it tends to widen and soften our midsection by retaining adipose fat (the fat that is found around our bellies). Our body needs to reduce our cortisol levels and sleep is the most effective way to do this. But how the hell do we do this when we are at the mercy of our little ones’ schedule? 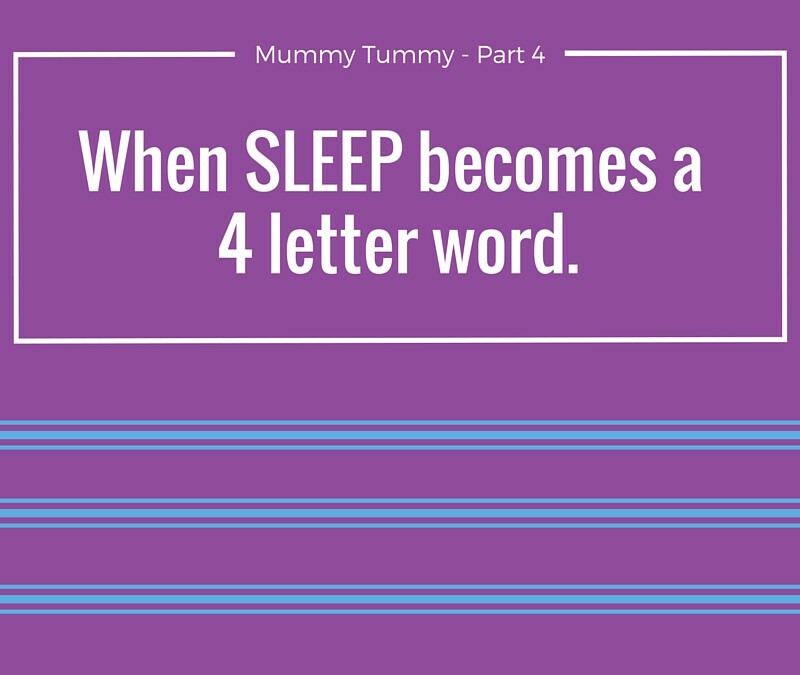 I am not going to tell you anything you don’t know (I told you this email would be annoying) but I hope that after my first 3 Mummy Tummy emails of listening to my awesome wisdom you will try and implement some of these practices into your sleep habits. 1) Shut it down. Turn off the computer. Turn off the harsh lighting. Turn off your phone (or dim your screen). Turn away anything that is stimulating. If you know you are going to try and go to bed shortly after your little one, shut it all down. 2) Grab it when you can. You will always have to pick up that last thing, call that last person, sweep that last bit, eat that one more treat, send that last email, etc. Cut it out. Grab a nap. Lie your head down. Give yourself what YOU need. Not what everyone else needs. I know that sounds revolutionary because we are now programmed to give it all away. But take something for yourself Mama. Climb under the blankets. Curl up on the couch. Shut your eyes. 3) Treat yourself like a baby. Little ones are not the only ones who need a routine. Your body still needs to be told that it is bed time. And just like we build a routine for the little ones to give them the cue that it is time to wind down and go to sleep, we can give ourselves that gift. Do what calms you down. Have a shower. Put on comfy clothes. Have a glass of wine. Read a book. Stretch. Breathe. Meditate. But do them in the same order every single night that you can. Give yourself a head start. 4) Write it down. I have a problem shutting my brain down. Things I think while lying in bed: Did I lock the door? Do I have a bottle ready for the little dude? Did I remember to return that email? What’s the weather going to be like tomorrow? Who is going to win The Bachelorette? It is a crazy place up there, in my brain. So one of my best practices now is writing it all down before I attempt sleep. I just brain dump onto a page either in free form or a list of things I need to get down. It has really helped me quiet my brain! There are so many more things I could list: clean sheets, a sound machine, help from friends and family to grab cat naps, etc. but only you know what works for you, Mama. All I ask is that you set yourself up for success as best you can.